If you are looking for a really simple craft to do with little ones, then these spooky window decorations are perfect. 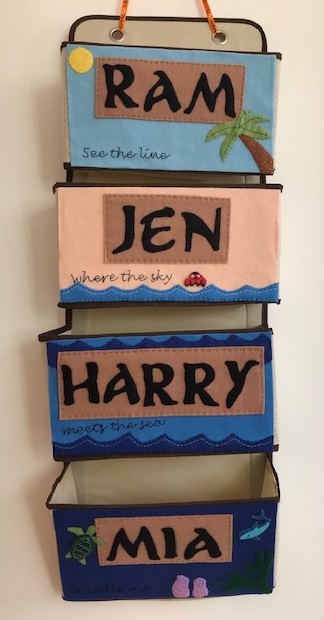 They can easily be made even by really little ones, and they look really effective when displayed in the window, whether during the day or at night. To make the window decorations, all you need is thin black card, some clear contact paper (sticky backed plastic) and tissue paper in suitable Halloween colours. First cut out your shape from the black cardboard - I made a pumpkin and a haunted house. Then place the entire piece of card onto a face up piece of clear sticky backed plastic. Tear some coloured tissue paper into small pieces, and help your toddler to place them onto the sticky areas. You can add detail to the image by positioning cut outs from black card, like the face of the pumpkin or the windows of the house. But when the light is behind them I think they look very spooky! 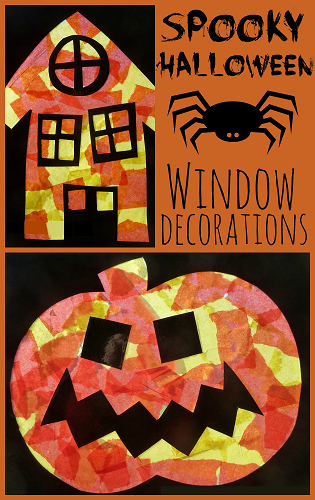 They are so easy to make that you could come up with different ideas every year and cover an entire window. I've written about lots of things that you can do with very little ones at Halloween. My children both loved the Halloween sensory tub that I put together and the Halloween ice block excavation activity. They also had a lot of fun with this make a monster busy bag. Finally, if you are planning a Halloween party for little ones you might like this post - some simple Halloween party ideas for children.